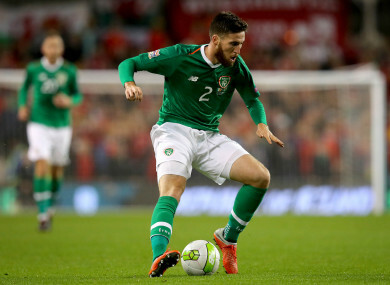 REPUBLIC OF IRELAND defender Matt Doherty has been ruled out of tomorrow night’s clash with the North through injury. The Wolves wing-back sustained a facial injury in Premier League action on Sunday, suffering an elbow to the head in his side’s 1-1 draw against Arasenal. He was absent at Martin O’Neill’s squad training in Abbotstown yesterday, mounting speculation that he was a major doubt for the Aviva Stadium-hosted friendly (kick-off 7.45pm). The FAI confirmed the news this morning, adding that Doherty will also miss out on the Nations League meeting with Denmark on Monday. The Dubliner made his competitive international debut in Ireland’s draw with the same side in mid-October, capitalising on his first Premier League goal and the English top flight’s Player of the Month award he won the previous week. He scooped the award for September ahead of Chelsea star Eden Hazard. The rest of the Ireland squad are training at Abbotstown this morning. It was announced in the press conference that Preston midfielder Alan Browne is being monitored due to a shoulder problem. Email “In-form Ireland defender Doherty ruled out of clashes with the North and Denmark”. Feedback on “In-form Ireland defender Doherty ruled out of clashes with the North and Denmark”.